Mr. Atkinson’s death is also on record in SPL. “Mrs. Nannie Lucretia Atkinson, 74, of 226 Emily Street, died this morning in Sacred Heart Hospital where she had been a patient since August 5. Mrs. Atkinson had been in failing health two years. Born in Barton, she was a dauther of the late Charles O. and Bridget (Naughton) Miller. Her husband, Floyd C. Atkinson, preceded her in death. Mrs. Atkinson held membership in the Dawn Bible Students Ecclesia sect. Surviving are a son, Robert E. Atkinson, this city; two daughters, Mrs. Benjamin F. Newcomer, Flintstone, and Mrs. Walter C. Chandler, Braddock Farms; two brothers, Sinclair Miller, Barton, and James T. Miller, this city, four grandchildren and two great-grandchildren. The body will remain at the George Funeral Home.” [CET 9-28-1955, p. 13]. Mrs. Atkinson was married to a man named Peter Welsh prior to her marriage to Mr. Atkinson. This union produced a son named Robert Emmett Welsh who was later adopted by her second husband, JOHN FLOYD MCCULLOCH ATKINSON. a. 54 yrs. 2 ms.
Mr. Baker came to the U.S. in 1860 from Germany. He is listed as a Civil War soldier in CET 5-29-1912 (p. 11). Scharf lists him as a City Councilman in 1881, the year before he died (p. 1479). a. 68 yrs. 6 ms. 25 dys. “Died—At his residence at Washington Mine Saturday, September 29, 1883, Mr. James Barnard, aged 68 years. He leaves a wife and 8 children to mourn his loss. He was buried Sunday afternoon in the old cemetery. Rev. R. Kolb officiated. The pallbearers were Messrs. H.B. Shaffer, T.G. McCullough, Jesse Arnold, George Hocking, John Connor, and Henry R. Atkinson.” [FMJ 10-6-1883]. 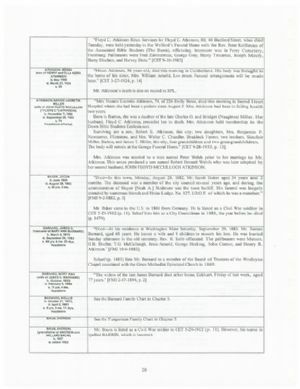 Scharf (p. 1481) lists Mr. Barnard as a member of the Board of Trustees of the Wesleyan Chapel associated with the Grace Methodist Episcopal Church in 1869.
a. 71 yrs. 4 ms.
a. 9 yrs. 5 ms. 11 dys. See the Barnard Family Chart in Chapter 5. See the Yungerman Family Chart in Chapter 5. Mr. Baum is listed as a Civil War soldier in CET 5-29-1912 (p. 11). However, his name is spelled BARRIN, which is incorrect.